Can you tell us a little about your job and how you came to be doing it? I'm Andy and I run The Courtyard Dairy near Settle. I fell into cheese from fine dining really. I grew up in a hotel in Appleby and just loved food, so after studying hospitality with culinary arts I worked in Edinburgh at the Balmoral Hotel’s Michelin starred restaurant, Number one. There we used to visit a lot of suppliers and I always loved visiting the small farms that made traditional cheese. So I thought, I'll explore this and jollied off to London to work for Paxton and Whitfield in Mayfair, Britain’s oldest cheesemonger. An apprenticeship in cheese ageing in France soon followed, before I returned to the UK to work as quality manager for The Fine Cheese Company in the South-West. However in 2012 my wife, Kathy, and I wanted to come back North so decided to set-up by ourselves to try and create a cheese shop that was truly special and only really championed proper traditional farmhouse, unpasteurised cheeses from family farms we’d visited. 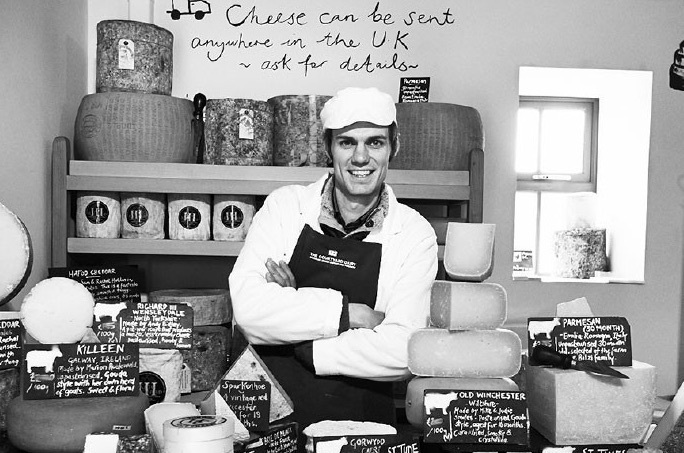 A select range but of really amazing cheeses, and so The Courtyard Dairy was born! What aspect of your job and the place where you work makes you feel happiest? I really love what we do. Every part - from the amazing customers who come in and have really supported us; to tasting the cheeses that are fabulous (I love it when a particular one is ‘on form’) to speaking to the families that make the cheeses. I always say that I like paying my bills because it means I've sold a lot of someone's cheese who I really want to champion and support. Come to think of it the only thing I don’t like is having to make the tea. They still make me do it though. 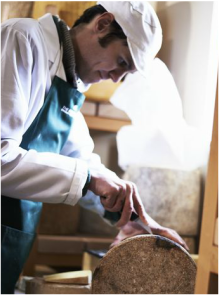 We really try and stick to our ethos of championing ‘proper cheese’; all with a real story that if you scratch away at has the identity of the farm and traditional method it was made – no marketers here! This “no compromises” was difficult at first; as we don’t do many cheeses people have heard of (most of our cheesemakers and farmers are very small with around 50/60 cows) so we often didn’t have what people were looking for – we had to educate the customers into what else they could have by giving tastes and telling them about why we do what we do. If some one is feeling a little down and perhaps in need of a boost, where in the Yorkshire Dales do you suggest they should visit? Littondale, but drive over the tops from Settle (via Langcliffe). The drive is so beautiful and tranquil, and you get no phone reception. Be sure to stop on the way and have a picnic. If a visitor was coming here for two days what would you recommend they should try to do? Any particular places to eat or drink you'd like to recommend? Walk a Peak. If you time it right also go to watch the Salmon jumping at Stainforth and for bank holidays get the winch down Gaping Gill. I think we are also blessed with food and drink producers round here. When I moved up from the South I thought it is going to be hard getting food as good as I did down there. How wrong could I be?! I have never had better ingredients. Growing with Grace (Clapham) for fruit and veg, Blue Pig Company (cracking gammon and sausages), Hellifield Highland Beef (roasts, and steaks), Drake and Macefield Butchers (the best bacon), the fish man and the baker (Fat Flour) on the Tuesday Market. Use them, you’ll be amazed at how good their produce is. I was. Eating out round here to is brilliant too. I could list numerous restaurants that I think do an absolutely brilliant job, the food is really special and the service relaxing and friendly – from great gastro like The Angel at Hetton, Grassington House and Le Caveau in Skipton, to something really special like The Burlington at The Devonshire Hotel and The Yorke Arms in Ramsgill; they are all worth every penny. For something less posh, local fish & chip shop, The Fisherman in Settle is hard to beat! Is there somewhere in the Yorkshire Dales where you feel sudden swooping joy? The road from Grassington to Pateley Bridge then onto Ramsgill. I love that drive. In the early days I used to hand deliver cheese up to The Yorke Arms (we now send it by courier) every week, and that bit of the drive was just amazing. It always made me feel really happy. Maybe it helped that I used to stock up on pork pies in Pateley Bridge! Is there a happy detail in everyday life that many of us miss? Eating as a family unit round the table. That is my favourite part of the day – sitting down to a good meal with my wife, with no distractions and just talking. Where's your favourite place to just sit and look? I love the view from the top of Settle flagpole. Just overlooking Settle reminds me of how lucky I am to live here. I often think I have quite a specialist cheese-shop, a rare and unique thing they are often only in cities, yet I get to live here! And the people of Settle have been so good to us in their support it really gives me a warm feeling. Chris Wildman who runs Town End Farm Shop I think he is always in a good mood, loves food and really does a lot to champion local Yorkshire businesses.